The song goes when the moon hits your eye like a big pizza pie, that's amore. You know what true amore is? Pizza pie. It's a stereotype that pizza is one of the staples of the college diet, but really, there's a lot of truth to that. Once you split the pie amongst friends, dinner's pretty cheap (a college necessity), and if you keep the pizza to yourself, you have leftovers that should last you a few meals. Delivery pizza may be more convenient, and in some cases, better tasting than the frozen variety. But a good frozen pizza is a great way to get a few filling meals for cheap. The risk is being stuck with a poor-tasting pie. And that ain't amore, that's disaster. 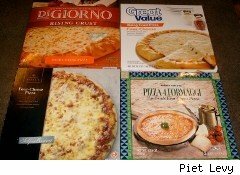 Store Brand Scorecard tried out four different brands of frozen four-cheese pizzas -- one national brand and three store brand equivalents -- to find the best pizza for the price. All products were purchased Sept. 18 in the Chicago area. Prices are subject to change. Cost: $4.98 at Walmart; $5.99 at a Chicago area grocery store. Taste: This being a four-cheese pizza, we would have wanted a bit more, well, cheese, but it's the superfluous sauce that dominates the flavor. That said, the sauce is pleasantly tangy, and the crust has a good crunch. Taste: There's little love for this pizza. The cheese blend is bland, and again the sauce overshadows the cheese, but this time it barely tastes better than tomato paste. Taste: Finally, a pizza where the cheese is the star! The blend on this pie is a savory standout, the crust crunchy and flavorful, and the slightly sweet, slightly spicy sauce enhances the pie, not overpowers it. We ate way more of this pizza than we should have, and had a bit of a stomach ache, but it was totally worth it. Taste: This Italy-made pie's decidedly different than the other three, with a thinner crust and different blend of cheeses. (Specifically, edam, asiago, pecorino and grana, compared to the others' use of mozzarella, parmesan, asiago and romano.) The cheeses do stand out, providing a bit of bite, and the crust is nice and crispy. But this pizza's not so filling, and while we complained about the abundance of sauce on the other pies, frankly there's too little sauce here. Greatest Value: Walmart's Great Value is the obvious loser. True it's filling and a dollar cheaper than what DiGiorno goes for at Walmart. But not only was it the worst pizza, it was only a penny cheaper than the other two store brand varieties. On a scale of 0 to 10, Great Value gets a value score of 2. Coming in third is Trader Joe's Trader Giotto's brand. Gotta appreciate TJ's going so far as to use unique cheeses and source its pizzas from Italy, but this pizza's more than 50% smaller than the others at Great Value and Safeway Select, which go for the same price. And this brand's nowhere near as good as Safeway Select. Value score: 4. DiGiorno's is pricey compared to the store brands, but it's still cheaper than delivery, and it's the second-best tasting pizza in the bunch (even though we would have appreciated a little less sauce). That earns it a value score of 6. But the absolute, undisputed pizza champion is Dominick's (Safeway's) Safeway Select brand. The best cheese, the best sauce, the best crust. Plus there's plenty of pie for a price that equals Walmart and Trader Joe's, and is a dollar less than what DiGiorno goes for at Walmart and $2 less than its price at Dominick's. Friends, this pizza earns a perfect value score of 10. Piet Levy's Store Brand Scorecard tests a major label food product and three private label equivalents to see which brand offers the best value for the price. It appears every Monday on WalletPop's Money College page. Send suggestions, including items you want Levy to try, to moneycollege@walletpop.